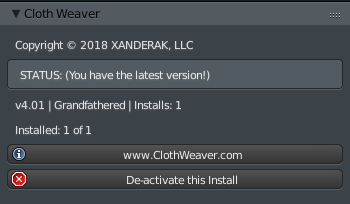 Cloth Weaver 4.01 gives users the power to easily migrate their license from one machine(s) to another/others (depending on how many installs they have). Example: John has 1 install of Cloth Weaver on his desktop and wants to put a copy on his laptop for work on the go. John opens Cloth Weaver on his desktop and clicks the “De-activate this install” button. He moves over to his laptop and launches another copy of Cloth Weaver. He enters his license key and email address and now has access on his laptop! Once John is ready to work on his desktop, he simply repeats the process by clicking “De-activate this install” on the laptop version, moves to his desktop, enters his license key and email and now has access again on the desktop. Thank you for being considerate of the users. As a past developer, I always tried to make life easier for my users. When you said that you would be issuing only one license for those of us who are grandfathered in, I was a little dismayed as I do the same thing as in your example with a desktop and a laptop. I can deal with the very slight inconvenience of deactivation/activation of the license. This is a great product and I look forward to turning out some clothing items with it. First off I’d like to thank you for grandfathering in those of us who bought ClothWeaver before the change in licensing. While the current method is a workable solution for those of us who are grandfathered in I personally don’t like to be nagged or bothered when I launch a piece of software. What happens if we have the software activated on our desktop but are away from home and need to use it on our laptop? It appears to me that it would lock us out until we can get home to be able to de-activate the desktop at which point we may be using that anyway instead of the laptop. Is this correct? A potential problem with current system as I see it, is what happens if a drive dies on us or the computer is not in our possession or any number of things that could make our access to the activated copy impossible. How is this resolved? Do we contact you directly? A possible fix for this problem as I understand it would be to have the “De-activate this install” button’s function changed so that it de-activates any other copy running on the license server and activates the current copy of the software. This should allow multiple copies to be installed but only one running at a given time. Using the current license procedure: Allowing two installs to be activated at the same time would be a workable solution also as I also have both a desktop and laptop as well. Allowing two copies to be activated at the same time is common for many commercial software and shareware. Perhaps the best solution overall may be to have the software check a license server when launched and allowing only one copy to be running at any given time. This would allow installing the software on multiple machines, more of a user license rather than a cpu license. Anyway my thoughts on the matter. Keep up the good work and I hope the current pricing structure works out for you. Thank you for bringing up this important topic, as I will need to address this in a future update. At the moment, if a user needs access on their laptop and cannot de-activate a copy on the desktop, they will need to contact support@clothweaver.com to enable the activation. As a solution to this problem, I am leaning towards the last example you gave of switching more to the “user license” as opposed to “machine” based. I will do some research on different models and implementation.